The Mother's Union can provide a range of resources to help you publicise its activities in the diocese and around the world. See also the Marketing page for downloadable leaflets and the Shop page for information about our catalogue of gifts. For Cymbal, please contact Andrea Walsh. Cymbal is the newsletter of the Mothers' Union in the Diocese of Manchester. Download PDFs of back issues here. Families First is the Mothers' Union bi-monthly magazine in print and online. Families First is for people who care about family life and who want to support families in thei r community and around the world, providing relief and comfort in times of crisis. 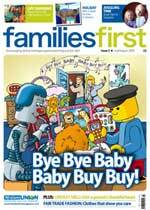 You can read or listen to a sample of the magazine and order online at www.familiesfirstmagazine.com. Members should contact the office to subscribe to Families First - for members there is a reduced rate of just £10.50 for six editions. Published by the Faith & Policy unit of Mothers' Union and the Church of England each month. Click here.